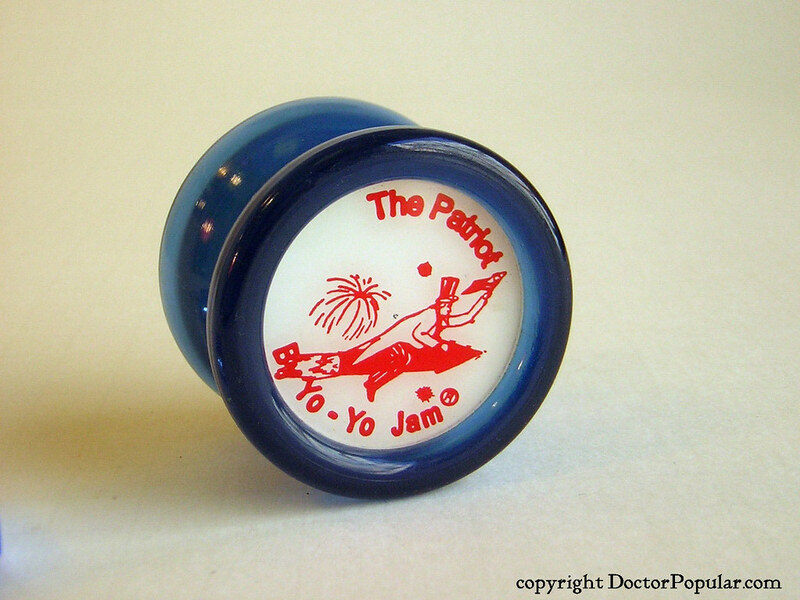 After the release of Duncan’s popular Freehand yo-yo, YoYoJam felt they needed a wide bodied yo-yo in the $15 range. They used their Dragon Jam as the basis, but pulled the edges out further to give it that wide/smooth design. 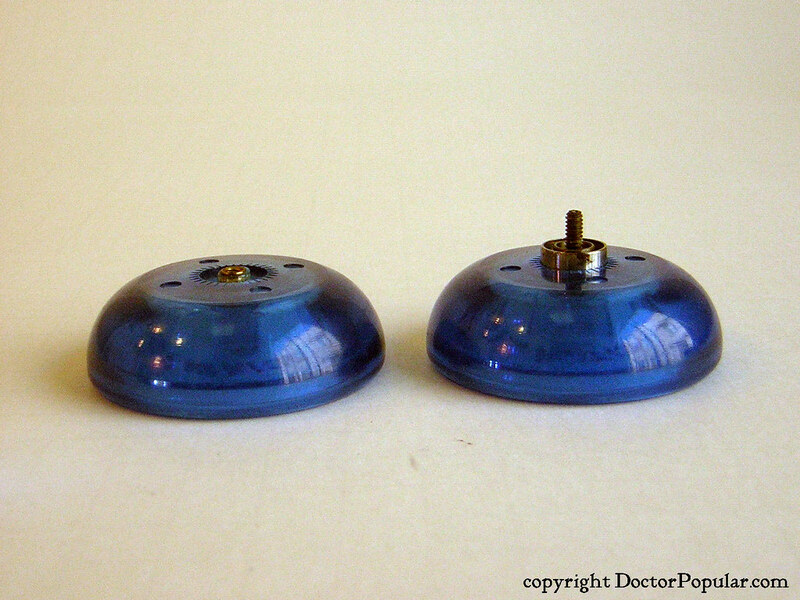 I begged Dale to make the yo-yo with friction stickers, but Dale just wouldn’t go for it. 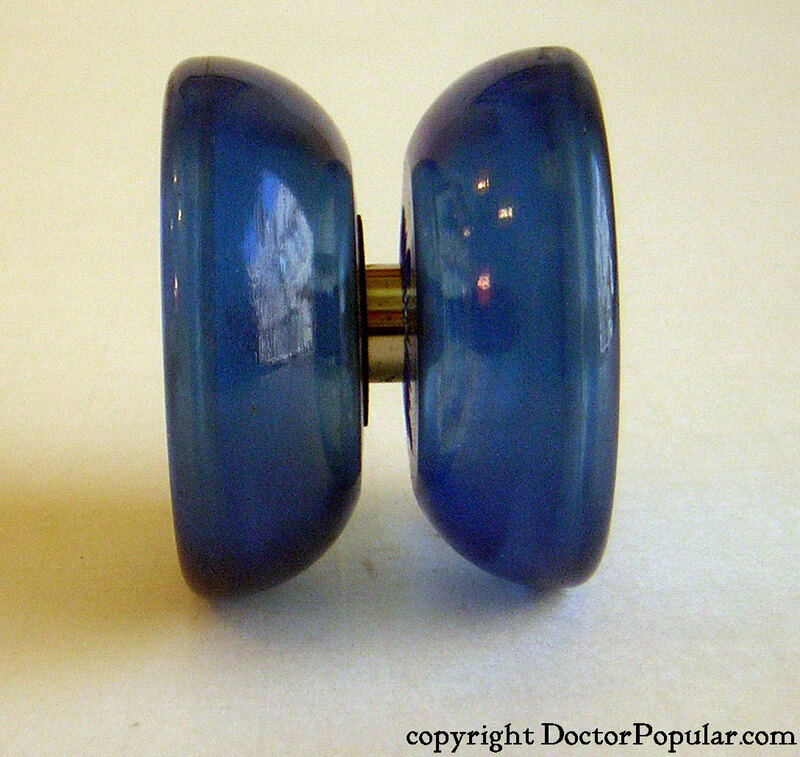 The design of the yo-yo began in October of 2001 and the yo-yo was released in September. I don’t recall ever hearing this new wide bodied YYJ referred to as anything other than a modified Dragonjam, so I assume that calling it “The Patriot” was a reference to the terrorist attacks earlier than month. 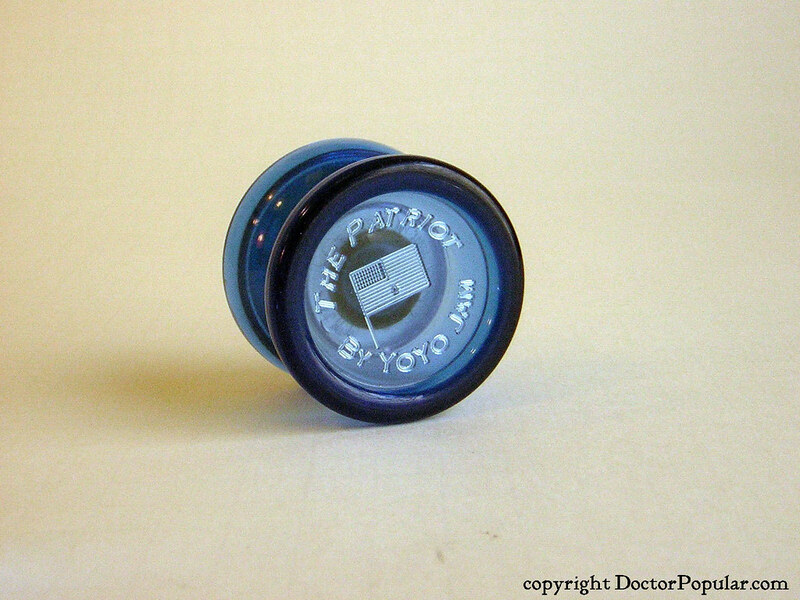 Around this time, everyone had little flags on their car and there was a certain universal patriotism in the air, so it wasn’t really a surprise to find out that YoYoJam had decided to call their new yo-yo The Patriot… but I was a little surprised when I first got mine and saw that the pog art was of Uncle Sam riding what appeared to be a missile (but it could be a firecracker) with an American flag. The whole thing seemed a bit too over the top. It looked like a bad biker tattoo, minus the bald eagle carrying lightning bolts with it’s wings wide spread and symmetrical. Luckily, I wasn’t the only person who thought the pogs looked horrible, so the next batch of Patriots came with engraving on the inside of the pogs of an American Flag. This lasted for a month and then they started making a simpler foil pog with a much simpler Patriot logo and no imagery. The Patriot later became the basis for the Bolt and the Kickside. Why they changed the name to the Kickside is beyond me, it’s just a Patriot with o-rings. 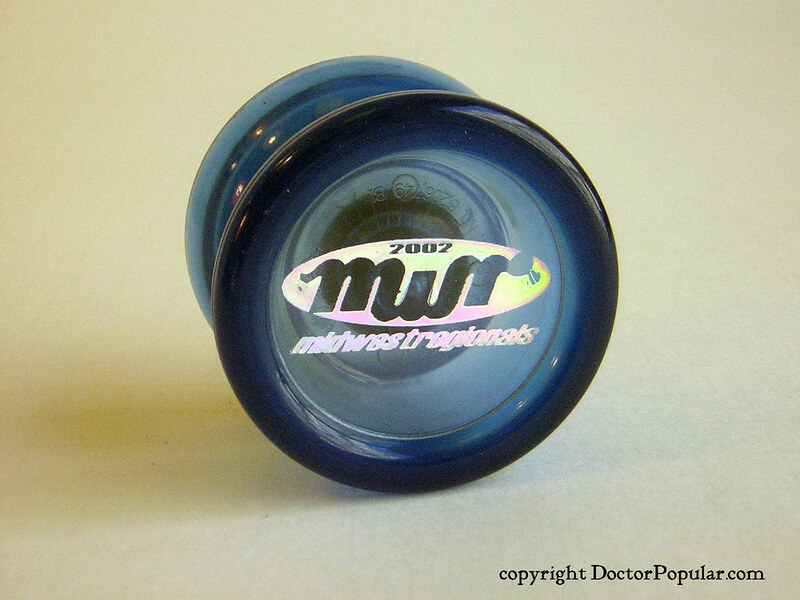 In the bottom pic you can see my Midwest Regional special edition Patriot with a logo designed by TitiFreak. Just a reminder, this year’s MWR is this weekend at the Mall of America. Wish I could be there! Oh man, I love my patriot, definately one of my best performers. Also, I got one of the pink ones. If I remember correctly it was one batch that was accidentally dipped in read after being dipped in red. The result was an awesome bright pink color. There was only ever one batch of them, and if I remember correctly (it’s been a long time) there were only 36 of them. 6 of the were sold through II to the public, and the rest were distributed to team YoYoJam. I’m still torn about wether I should be playing with it or keeping it safe. It’s a simple choice for me… If I don’t own anything I can’t play with it. If you love something, give it a throw.